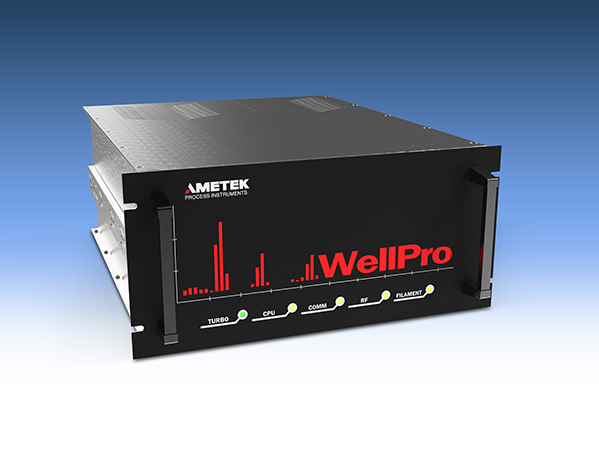 PITTSBURGH, PA— The new WellPro process mass spectrometer from AMETEK Energy & Process Instrumentation provides near real-time quantitative analysis of C1 through C7 components of mud gas in less than 10 seconds. Along with C1 through C7 components, additional analysis components are available. The WellPro’s 19-inch wide, rack mount chassis is designed for deployment under harsh conditions. Its speed and accuracy of the WellPro make it well-suited for drilling fluid applications in which surface logging data is vital for determining the pay composition along with quality and location. Data measurements now done by gas chromatography-flame ionization detector (GC-FID) top out at C5 and take upwards of a minute to process. As drilling speeds and directional capabilities improve, determination of pay quality in narrow zones has become more important. At the heart of the WellPro mass spectrometer is a field-proven AMETEK quadrupole mass filter, with excellent stability, sensitivity and resolution across the whole mass range. Proprietary software provides for easy set-up and operation and includes advanced alarm and automation capabilities. The accuracy of the WellPro is maintained by using a small gas cylinder to verify the instrument’s performance. Recalibration, if required, is completely automatic. Autocalibration maintains the performance and accuracy of the system, while its self-diagnostic features and modular design ensures ease of maintenance. Transferring data from the WellPro is easy and fast. Modbus and Open Platform Communications (OPC) are standard with the instrument, along with the Wellsite Information Transfer Specification (WITS) communications protocol. AMETEK Energy & Process Instrumentation is a unit of AMETEK, Inc., a leading global manufacturer of electronic instruments and electromechanical devices. AMETEK E&PI consists of AMETEK’s Chandler Engineering, Grabner Instruments, Petrolab and Process Instruments businesses. Its WellPro process mass spectrometer draws on AMETEK’s more than 30 years of experience in mass spectrometer design and manufacture and nearly 40 years in the design and development of sophisticated process analyzers. •	Process Instruments, 150 Freeport Road, Pittsburgh, PA 15238. Phone: (412) 828-9040. Fax: (412) 826-0399. Web site: www.ametekpi.com. •	Chandler Engineering, 2001 North Indianwood Avenue, Broken Arrow, OK 74012. Phone: (918) 250-7200. Fax: (918) 459-0165. Web site: www.chandlerengineering.com.